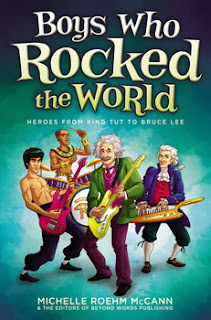 I read Boys Who Rocked the World. I started reading it because my mom gave it to me. One word I would use is interesting. The chapter about Pele, because he’s a famous soccer player and I really want to be a professional soccer player when I grow up. There’s not a main character because each chapter is about a famous person in history, like Crazy Horse. Because it’s a good book and you can learn a lot about cool people. I think it is a little weird how the guys are all playing instruments. Yes, if it was about different people though. What was one interesting thing you learned from this book? Bruce Lee died because he had a headache and he took a pill that he was allergic too and it made his brain swell up and killed him. What's next on your list to read? I'm really, really excited to read Poached by Stuart Gibb because I laughed so much when I read Belly Up and it takes place in the same amusement park as that one, so I can't wait to see what it's about. Thanks for being with us Jack! Good interview! Coffee ice cream for an 11yo is surprising! I love how you switched up the questions to ask about what he is reading next- it's a nice little plug for those books, too.